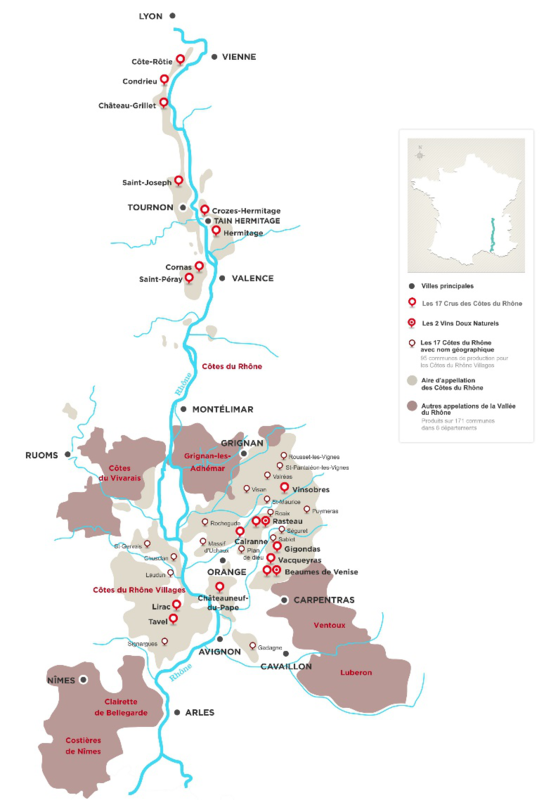 The Rhône wine region stretches from Vienne to Avignon along the Rhône River in the south of France. Scattered over the more or less steep banks of the river, it is the third largest French wine producing region after Languedoc-Roussillon and Bordeaux, with nearly 75 600 hectares of vines and a production of 3 000 000 hectolitres of red, rosés and dry white wines as well as a few sparkling wines and natural sweet wines. The region is characterised by its sun-drenched Mediterranean climate, interspersed with short periods of rainstorms and mistral, a mighty wind which benefits the vines running down the valley. There is a great diversity of soils (granite in the north, rounded pebbles, sedimentary clay and limestones, broken up limestone soils in the South) from the last foothills of the Massif Central to the steep hillsides at the foot of the Mont Ventoux, followed by small hills with more gentle landscapes towards the south, all making up a rich and varied terroir which produces wines with a really strong identity.